Hair restoration surgery is having a moment, according to results released today of a new member survey conducted by the International Society of Hair Restoration Surgery (ISHRS). The worldwide volume of surgical hair restoration procedures performed from 2014 to 2016 rose 60 percent, with 635,189 procedures performed in 2016. 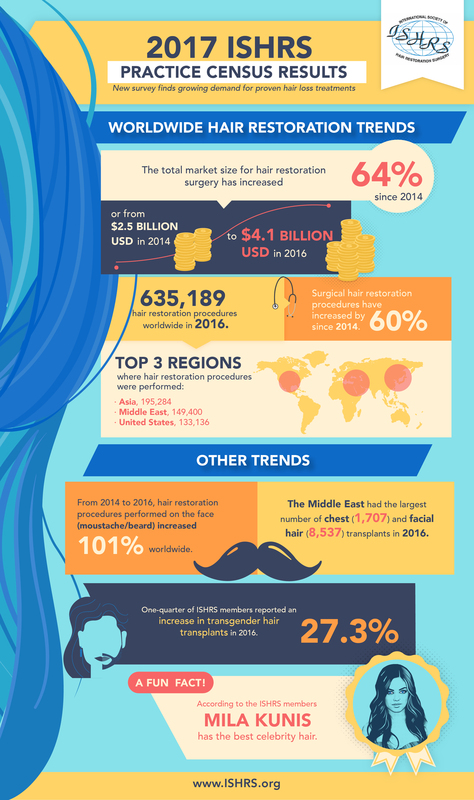 Of the 635,189 surgical hair restoration procedures performed worldwide in 2016, Asia led the way with 195,284 procedures, followed by the Middle East with 149,400 and the U.S. with 133,136 procedures. Overall, the number of surgical, and nonsurgical, hair restoration patients increased considerably from 2014. Specifically, 597,181 surgical patients sought treatment in 2016 (a 67 percent increase from 2014), with 1,241,764 nonsurgical patients treated in 2016 (a 78 percent increase). 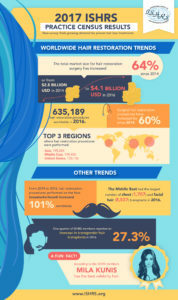 While worldwide economic growth remained relatively flat in 2016, the estimated worldwide market for surgical hair restoration enjoyed a robust increase — from $2.5 billion USD in 2014 to $4.1 billion USD in 2016. This represents a 64 percent increase in market size from 2014 (see the full report for details). Interestingly, the majority (61.1 percent) of hair restoration patients treated by ISHRS members in 2016 traveled more than 20 miles/32 kilometers for their procedure, including travel to a different state, region or country. Dr. Washenik stressed that patients who decide to travel for a hair restoration procedure need to do due diligence when researching and deciding on their surgeon, as the ISHRS has witnessed a black market spawning from non-doctor clinics illegally performing the procedure under the auspice of medical tourism. The ISHRS has provided information to help patients: http://www.ishrs.org/article/questions-ask-your-hair-doctor. The International Society of Hair Restoration Surgery (ISHRS) is a global non-profit medical association and the leading authority on hair loss treatment and restoration with more than 1,200 members throughout 70 countries worldwide. Above all, the ISHRS is dedicated to achieving excellence in patient outcomes by promoting the highest standards of medical practice, medical ethics, and research in the medical hair restoration industry. The ISHRS also provides continuing medical education to physicians specializing in hair transplant surgery and is committed to delivering the latest information on medical and surgical treatments to consumers suffering from hair loss, and most commonly from androgenetic alopecia – male pattern baldness and female pattern hair loss. It was founded in 1993 as the first international society to promote continuing quality improvement and education for professionals in the field of hair restoration surgery. For more information and to locate a physician, visit http://www.ishrs.org.